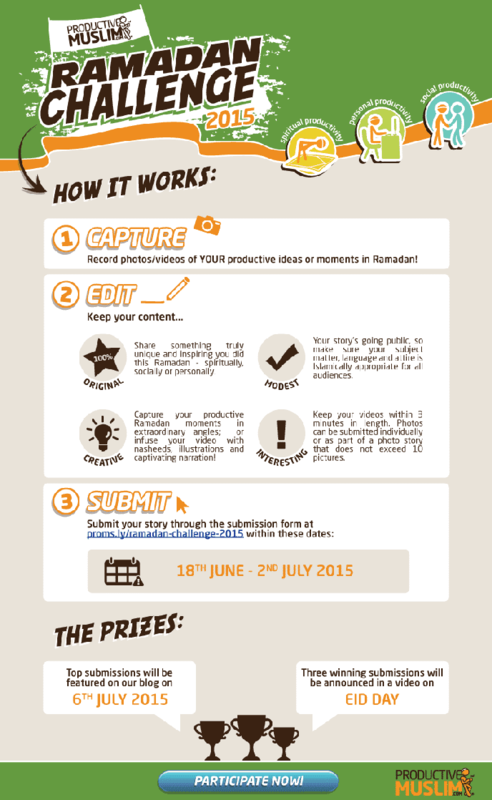 The ProductiveMuslim Ramadan Challenge 2015: Capture, Edit and Submit! The big day is here, Alhamdulillah: Ramadan has just begun and we’ve got millions of Muslims fasting world over at this very moment, mashaAllah! It’s incredibly heartwarming to see a command of Allah being observed in unison by the ummah in a time of deep division. At this very moment, we are all collectively making an effort to be better people by being more conscious of our words and actions, fasting from bad habits and behavior and prioritizing Allah’s pleasure over our own. Muslims world over have begun a month-long journey of spiritual, physical and personal productivity today. Together. Remember those times when you wished you could overshadow all the negative headlines with proof of how easy and incredibly transformational it can be to practice Islam everyday? We want to give you that chance today. For the next 15 days, we want to give you the opportunity to change the narrative by letting you tell the story. Grab your phone or camera and capture something awesome you’re doing this Ramadan: socially, spiritually or personally! Socially: community projects, special initiatives at the workplace, activities with friends and family, awesome Ramadan family traditions, etc. Spiritually: an awesome ibadah routine, doing ibadah at work/while commuting, acts of worship you’ve started to do in Ramadan, etc. Personally: how you manage your time and get everything done in Ramadan, steps you take to stay fit, your special Ramadan work-out!, your typical productive day in Ramadan, etc. Keep it creative: capture your productive Ramadan moments in extraordinary angles; or infuse your video with nasheeds (without instruments), illustrations and captivating narration! Submit your story now through the Ramadan Challenge Submission Form. All submissions MUST have photos or a video. All submissions should be made by 2nd July 2015. 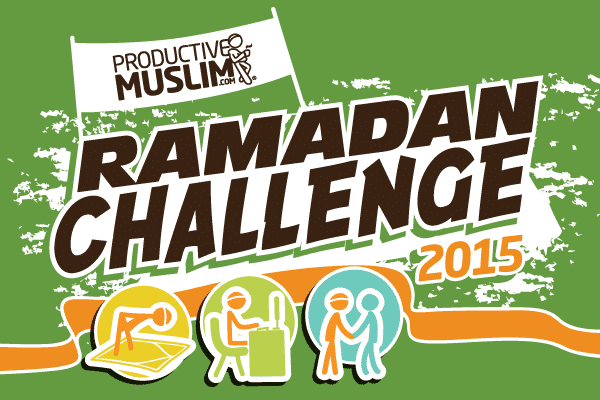 Top submissions will be featured on ProductiveMuslim on 6th July 2015 inshaAllah. Now tell us a story we’ll never forget, inshaAllah!